The Burmese cat makes an excellent pet. It has a sleek, shorthaired coat that is very easy to groom, a fine toothed comb used once a week will remove dead hairs. 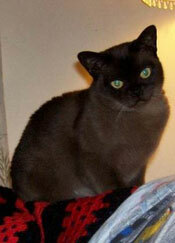 The Burmese cat is more intelligent and more affectionate than many cats, but above all it has a fantastic personality. It loves people and is very good with children, but it does not like being left alone. If you are out all day, then it is better to have two. Burmese kittens are extremely playful. They are born with pale hued coats, which will become richer as the kittens age. The Burmese is buoyant in nature, yet many people consider the smooth shining coat and yellow eyes the height of elegance. This cat will always give a grand bouncy welcome to the stranger, and time and affection devoted to this breed more than repays the owner in loyalty and companionship. 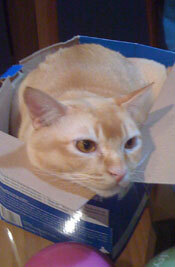 The Burmese is a medium sized cat with a muscular frame and heavier in body than its looks would suggest. The coat is fine, sleek and glossy and lies close to the body. The body is hard and muscular, chest rounded and back straight. The legs are long and slender, hind legs are slightly longer than the forelegs. The paws are neat and oval shaped. The tail is medium in length and tapering slightly to a rounded tip. It should not be whiplike or kinked. The head should be slightly rounded on top, with good width between the ears, wide cheekbones that taper to a short blunt wedge. The chin should be firm. The ears should be rounded at the tip and open at the base with a slight forward tilt in profile. The nose is medium in length with a distinct break in profile. The face should have a sweet expression. The eyes are oriental in shape along the top line and rounded underneath. They should be lustrous, any shade of yellow and set well apart.